America is becoming a class-based society. It is now conventional wisdom to focus on the wealth of the top 1 percentespecially the top 0.01 percentand how the ultra-rich are concentrating income and prosperity while incomes for most other Americans are stagnant. But the most important, consequential, and widening gap in American society is between the upper middle class and everyone else. Reeves defines the upper middle class as those whose incomes are in the top 20 percent of American society. Income is not the only way to measure a society, but in a market economy it is crucial because access to money generally determines who gets the best quality education, housing, health care, and other necessary goods and services. These trends matter because the separation and perpetuation of the upper middle class corrode prospects for more progressive approaches to policy. Various forms of opportunity hoarding” among the upper middle class make it harder for others to rise up to the top rung. Examples include zoning laws and schooling, occupational licensing, college application procedures, and the allocation of internships. 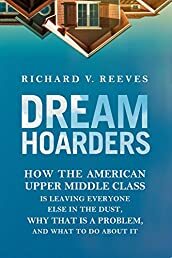 Upper-middle-class opportunity hoarding, Reeves argues, results in a less competitive economy as well as a less open society. Inequality is inevitable and can even be good, within limits. But Reeves argues that society can take effective action to reduce opportunity hoarding and thus promote broader opportunity. This fascinating book shows how American society has become the very class-defined society that earlier Americans rebelled againstand what can be done to restore a more equitable society. The New Urban Crisis: How Our Cities Are Increasing Inequality, Deepening Segregation, and Failing the..